Here on this centuries old playground of restored plantation estates, forgotten sugar mills and lush rainforests, a picture-perfect oasis beckons with romantic getaways, destination weddings and blissful honeymoons. 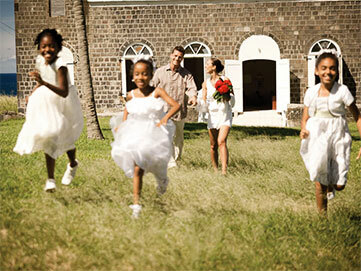 Follow your heart to St. Kitts and discover unique wedding venues, thrilling island adventures, fresh island cuisine and enchanting stays from boutique to luxury oceanfront resorts. ï¿½A lover’s playground of beguiling beauty, St. Kitts is an irresistible setting for sheer bliss on your honeymoon. Discover the best wedding deals and honeymoon packages available on the island and relax knowing you can enjoy paradise at the best possible price too. Say yes to forever at a hilltop fairytale fortress, walk down the aisle of an old stone church, plan an intimate celebration at a historic estate or say I do with your toes in the sand on a palm-lined beach. A hotspot for destination weddings, our wedding planners and event specialists offer expertise to orchestrate every element of your idyllic island celebration.